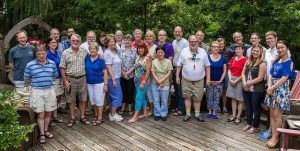 Faithful members of ACS-St. Louis Section gathered on Saturday, June 25 for the Annual Picnic. It was a very memorable get-together, enhanced by the appearance of Ben and Pat Outlaw. As some will know, Ben was severely injured earlier in the year when a large tree fell on him as he and his volunteer group were cleaning up a park in West County. Ben sustained very severe injuries to his neck, back and his eyes. It was wonderful to see him and talk with him about his recovery, which has been truly miraculous, and with great thanks to his loving wife Pat for taking such good care of Benjy. Though it was an extremely hot day, with temperatures hovering in high 90’s, everyone was quite comfortable as the picnic was hosted at the home of Joe & Brenda Ackerman and everyone could stay inside and enjoy the comfort of that modern convenience, air-conditioning. Going out on the back deck for a group photo was the only “not comfortable minute”. Thanks to Vic Lewchenko for setting up the great photo. (1) main entrance drive: turn west off Lucas & Hunt Road; Edison Avenue will be on the opposite side of the road almost adjacent to the entrance drive. Continue on the winding drive, and the parking lot will be on your right adjacent to the clubhouse. (2) back entrance: turn south off Natural Bridge Road onto St Marys Lane, just east of the post office. Continue through the gate, veer right, and park in front of the clubhouse. National Chemistry week is October 16-22, 2016. STLACS is hoping to host a public outreach event in celebration of National Chemistry Week at the Saint Louis Science Center (more details to follow). An event Co-coordinator needed. Interested volunteers should contact Greg Wall by email: gwall37@msn.com or phone 314-435-6487. St Louis Section–ACS Board of Directors meets the second Thursday of each month, usually at the Glen Echo Country Club (map and driving directions). Meetings are open to all members, and all are encouraged to attend. Elected officers and chairs of major committees vote on questions put to the Board; others in attendance have voice but no vote. If you want to attend for dinner, please contact the section Chair at least a week in advance. Usual cost of the dinner is $21.95 ($11 for post-docs and unemployed members). Bar service and dessert are optional extras. Members wishing to become active in section activities are welcomed for their first dinner as guests of the section. Seminars are generally on Fridays at 12 noon in Carlo Auditorium, Tegeler Hall, unless noted otherwise. Refreshments follow. For the most up-to-date information, refer to the department’s seminar page or contact Brent Znosko, znoskob@slu.edu. Mondays at 4 pm in 451 Benton Hall, unless otherwise specified. Refreshments 15 minutes prior to seminar time. For timely information on visiting seminar speakers, contact the Chemistry Department, 314.516.5311, or visit the seminar schedule. The department has additional seminar series which are also accessible from this page. Seminars are in McMillen 311 at 4 pm unless otherwise noted. For information, consult the departmental events page. Related seminars, including endowed seminar series and the WU med school biochemistry series, are linked here as well. Is your email address up to date? Please log in at the national ACS website, then under your name in the banner, click “Manage account” to make sure your email address is accurate. Thanks! If you need more information or have problems with this site, please contact the WebMaster.